Heavy traffic on floors often make the use of decorative flooring products impossible. 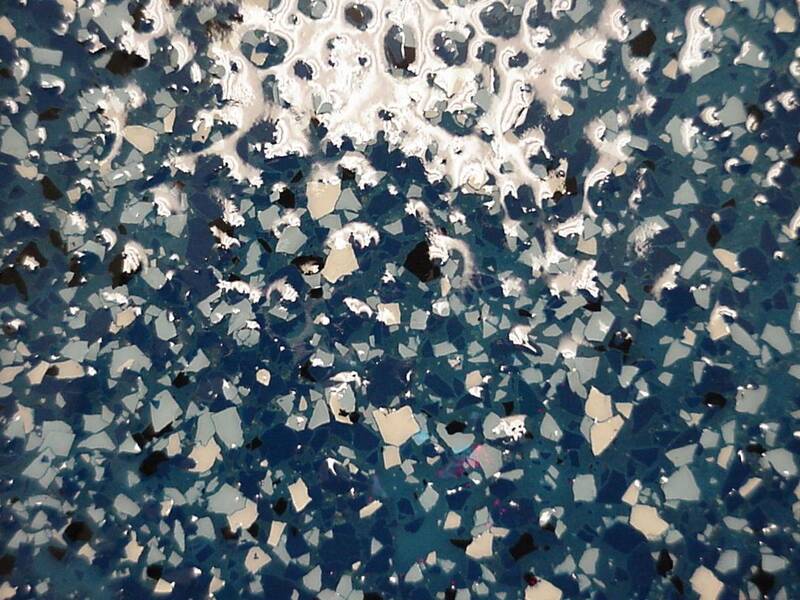 To make this possible we created Product #315 Seamless Polymeric Multi-Colored Flake Chip Floor Resurfacing System. Our #315 Chip System creates a beautiful, durable, and affordable floor that is easy to apply by both professionals and do-it-yourself enthusiasts. Note: This product is not available in the big box Home Improvement Outlets. It is only available from select authorized applicator/distributors or directly from Epoxy.com, who will give you the technical support that you need to install it properly. Do not accept the poor imitations, they will not perform like Epoxy.com Chip Flooring. Be sure it has the Epoxy.com logo on the label. Editors Note: This page and many other pages on this site contain picture thumbnails. Thumbnails are smaller versions of larger pictures. Thumbnails are used to speed the loading of a web page. To view the larger version of these thumbnails, simply left click the thumbnails the same way that you would click any other link. The larger version of the picture will then load. The concept is simple. 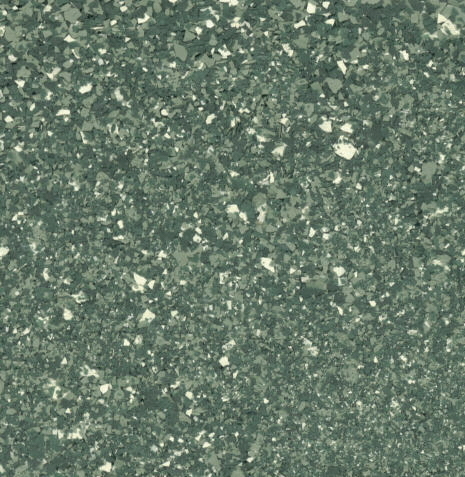 It is a combination of chips and flooring resin. A new product is "born". The flooring resin plays a leading role in the quality of the flooring system. 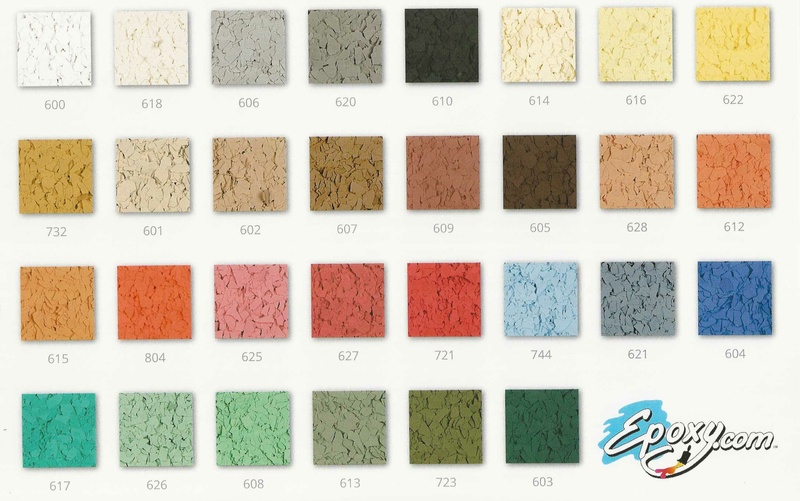 The color chips provide the additional decorative effect. 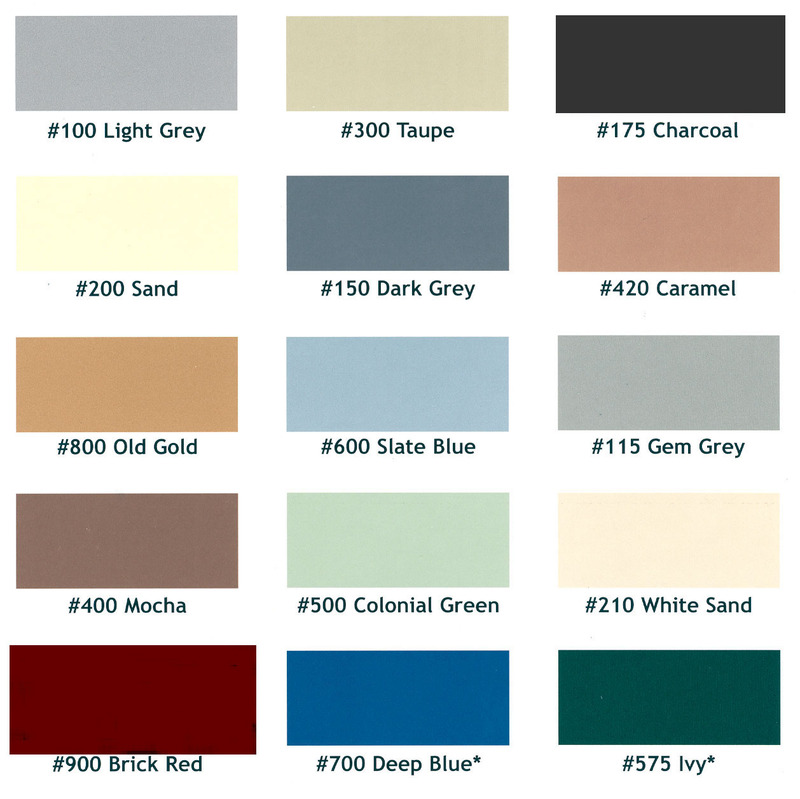 Please note: The pictures of color charts on this page and else ware on this web page are photographic reproduction of the color card for our products. The photo reproduction process and your monitor and/or printer will change these colors. This chart is to give you an idea of the colors available and not intended for critical color selections. Click the picture of color card at the right for a larger version of this picture of the color chart. Decide what proportions you want of each color by percent. And we will make it to your order, in multiples of 55 lbs. 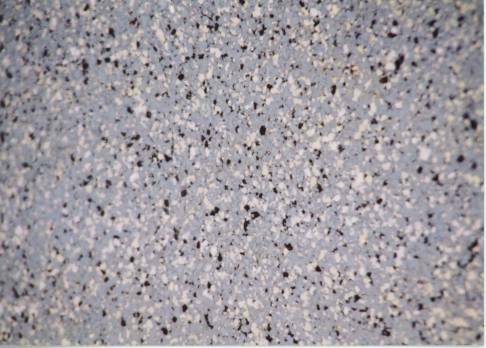 Epoxy.com Seamless Chip Flake Flooring System is easier to use than most people think. This ease of use also automatically means that work can be done more quickly. Saving time and money, while increasing quality! Step 1: A layer of flooring resin is applied to a suitable substrate. Step 3: The transparent top coat, which is applied in one or more layers, determines the final thickness. As dazzling as the visual effect is, there is more to making a product successful. There are many factors contributing to the success of Epoxy.com Chip Flooring. Many floor companies have difficulty finding good floor layers. The introduction of an easy-to-install product will be appreciated by everyone. The Chip Flooring precludes processing mistakes. It is "fool-proof", because an excess of chips are spread on the still wet floor paint. The extra chips are simply swept up after the floor has dried and can be reused. Taping off is unnecessary. The chips only adhere to the places where the flooring resin has been applied. This inherent simplicity is also the basis for the do-it-yourself product. The standard preparation of a floor is necessary when using the Chip Flooring System. The chips cover small cracks and holes, because of the light structure and multi-color effect of the final result. Uneven spots are hardly noticeable. An integral cove base can be installed to turn your room into a virtual "bathtub". The highest requirements apply, especially to floors with heavy traffic. 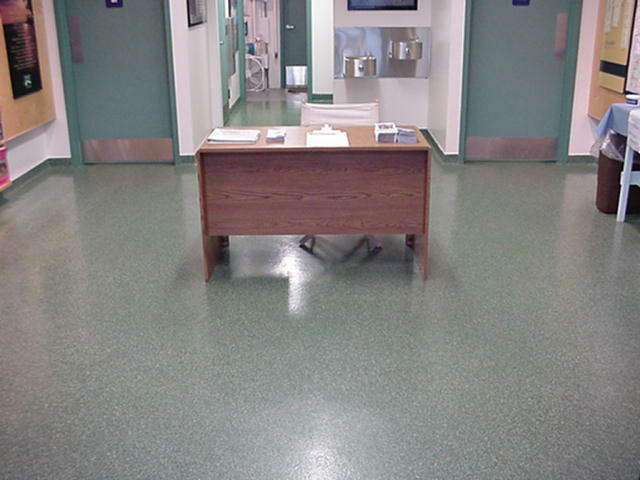 The Chip Flooring System offers a finish which is very easy to keep disinfected. The seamless and sealed surface can be cleaned in every possible way. Even with a high pressure water spray. The seamless sealed surface prevents the entry of dirt and bacteria. We can even add an optional anti-microbial to your Chip Flooring. 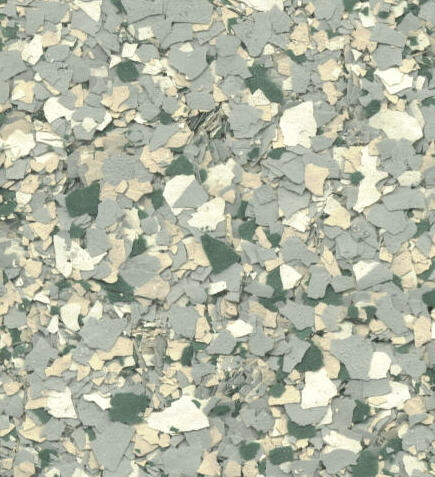 A floor made of Epoxy.com Flooring Chips is slightly textured and it is this texture that gives the floor good anti-skid qualities. This is especially important for areas where the floor gets wet such as entry ways, and pool sides. 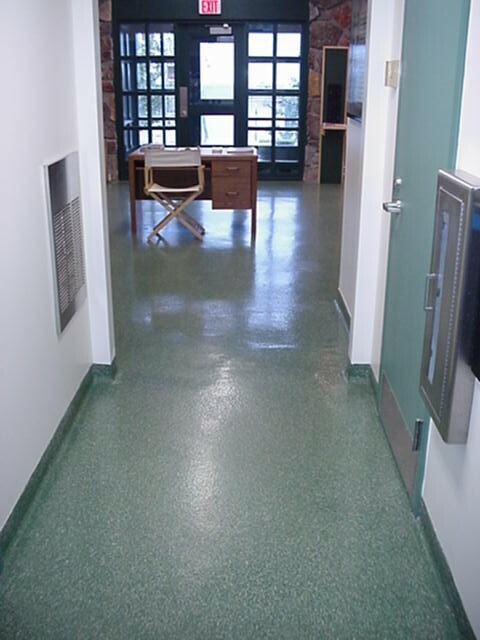 The use of Epoxy.com Product #315 provides a durability which can compete with similar types of decorative floors, with a much higher level of durability and reparability. Should the floor show scuffs after intensive use, this can be quickly solved by applying another layer of the transparent top coat. 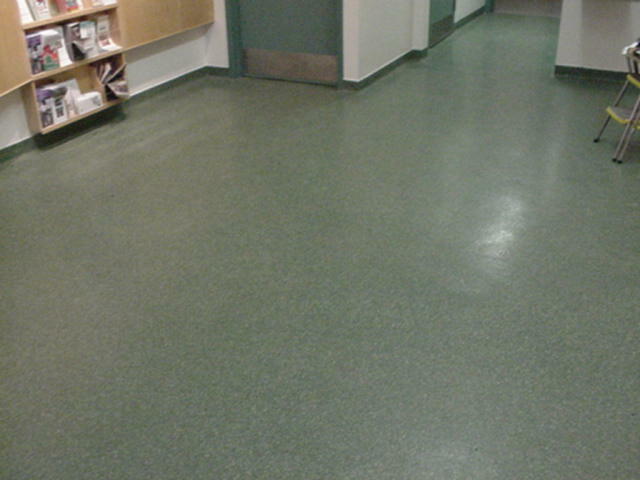 The floor looks new again after just one application. Only the best color-fast pigments are used to produce color chips. Even under exposure to strong ultraviolet light, hardly any fading occurs. Used with Epoxy.com Product #315 or other flooring resin that does not fade, the color chips create a strong, color-fast system. 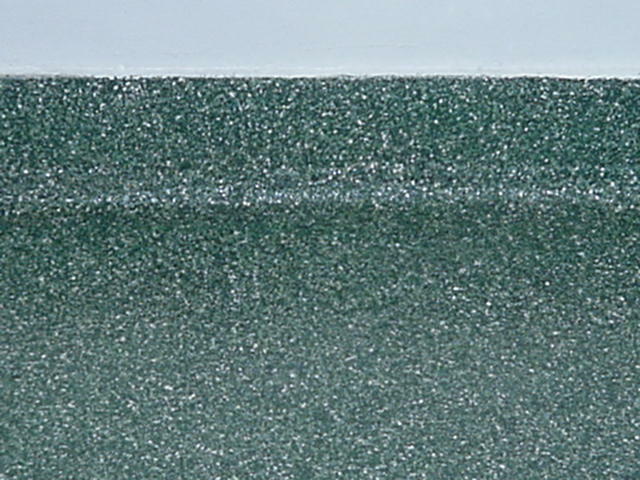 Epoxy.com Color Chips are supplied in many colors and different sizes. Making the right combination of colors creates extraordinary effects. This means that any requirement can be met. 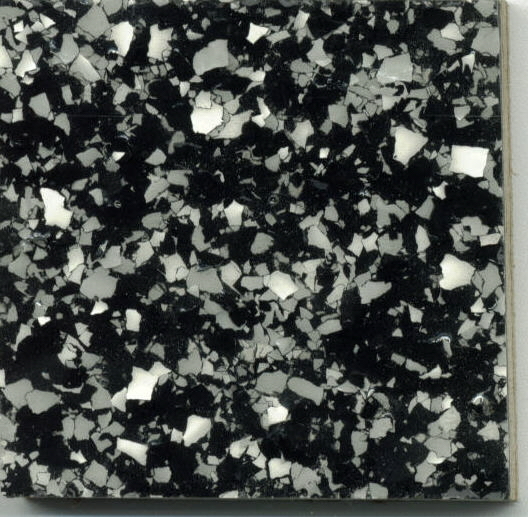 The thickness of the top coat can also be varied, yielding different appearance and anti-skid properties. Epoxy Systems, Inc. can assist with it's large store of experience. 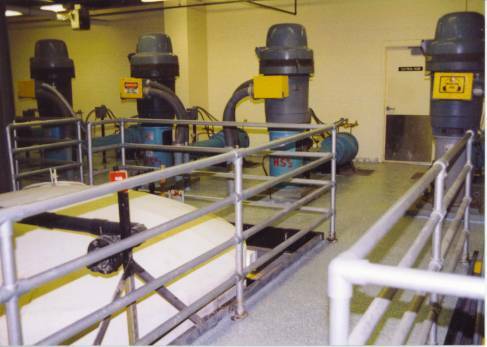 Epoxy Systems, Inc. are Consultants, and Resin Compounders. 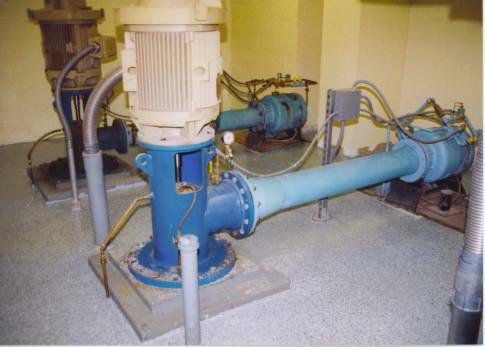 Technical services are handled by the Owner's of Epoxy Systems, Inc. who each average over 25 years of field experience. Indoor Environmental Quality/Air Quality Before Occupancy Materials meet the requirement for VOC content Pertaining to LEED IEQ 402 Indoor Emitting Materials Credit. Refer to the individual product component technical data sheets and MSDS for further information. For more information on the subject please go to Chip Flooring Installation Procedures for details on how to install chip flooring. For a list of job supplies to install a chip flooring see www.epoxy.com/job-supplies.aspx. 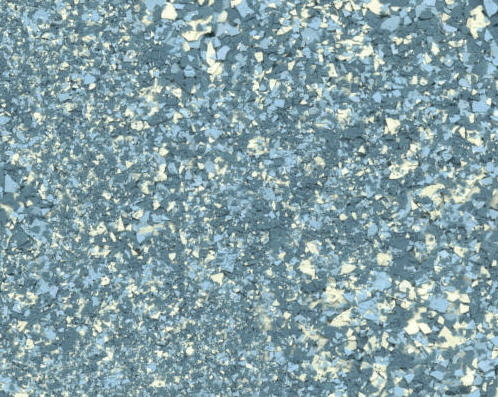 Chip Flooring can be modified for outside use, and in direct or intense sunlight. Check out this Job History.